We all know how hard it can be to eat healthy nowadays, day after day we hear of types of food we should not be eating due to a connection with some horribly wicked disease. 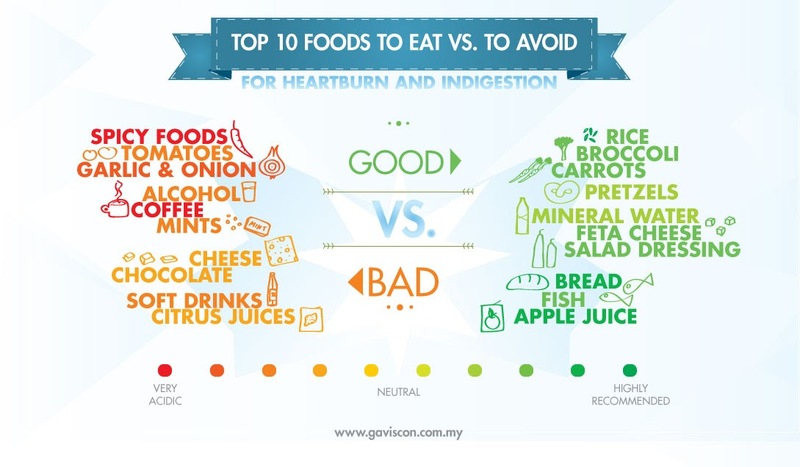 This following infographic, provided by Gaviscon Malaysia presents you with food to stay away from to avoid both heartburn and indigestion. Finally a way that you can see which foods you CAN eat. Let us start with the usual bad eating options though. Spicy foods weigh in at the top of the board with high chances of gaining indigestion and heartburn; this does not come at much of a surprise to many I am sure. However what may surprise you is chocolate has in fact been connected towards the symptoms of these issues too, so now you have an extra excuse to ditch the chocolate and go healthy! Who enjoys having heartburn after all? The healthy options include, rice, broccoli, fish and many more. The benefits in terms of healthy eating for these variety of foods are fantastic, such as the natural omega 3 oils found in fish, which helps the body joints and blood vessels. Whereas rich in calcium broccoli ensures stronger bones and a healthier heart amongst many other researched benefits. As long as you are not the prior US president pretzels are also acceptable forms of healthy eating. So get down to your local convenience store and pick up some natural pretzels to go with that movie later and why not choose some mineral water instead of the fizzy soft drinks you were originally thinking. Okay so that is probably not going to happen but its important to remember eating any unhealthy food and drinks in moderation is of course acceptable. It is all about getting that right balanced diet along with frequent exercise to ensure you have the best possible health. 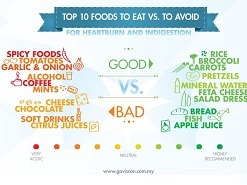 Hope this Infographic helped you to learn how to choose your Nutrition and which Foods you should eat.